OMG - What will they think of next!!! I'm amazed at what people come up with, but I guess its just a matter of time before someone thought to create a motorized kayak. 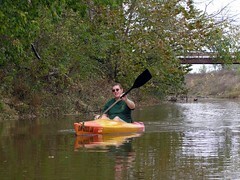 Dianne and I do a lot of paddling upstream looking for new kayaking routes in Oklahoma. I can imagine something like this being handy for longer upriver trips looking for new put-ins and stuff. However, for the most part I think it is silly. ...now Kayak Sailing THAT is an idea who's time has come, IMHO. Harness the Prairie Wind!